This TV Stand Holds Two Flat Panel Monitors on the Steel Mount! 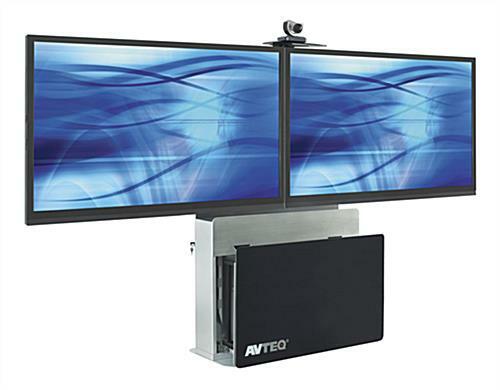 This Heavy Duty Plasma Mount Comes with an Adjustable Camera Tray for Video Conferencing! This TV Stand is One of Many Great Choices Available Here! Internal cable managing system neatly organizes wires. Six plug surge protector powers the different components. Sliding open cabinet space with rack mount shelving. This TV stand with dual mounting bracket presents (2) 70" screens that weigh less than 400 pounds in total. The video conferencing Plasma mount comes with a camera tray that adjusts. This TV stand with deluxe features, commonly called a flat panel monitor display, is made out of steel for a solid construction. There is a glossy black finish tempered glass cabinet door that opens to reveal a 19" x 20" cabinet space. 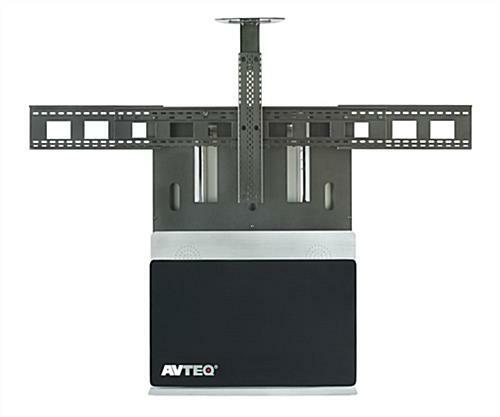 This steel TV stand has a vertical rack mount system that offers 10 rack units of area. There is a built in cable managing system that organizes all of the cords. This conference room TV stand with a heavy duty fabrication allows users to power the electronic applications with the power strip. The video conferencing workstation does not include the camera or televisions.